Facebook has launched a new tool to help you better manage sharing your information and postings on the social network among your friends and the public at-large. The social networking giant on Thursday rolled out its "Privacy Checkup" tool that will help its more than 1.2 billion users to audit their privacy settings on Facebook to make sure they know with whom they are sharing their personal and very private details of their lives. The expanded feature was originally announced by the network giant back in May. 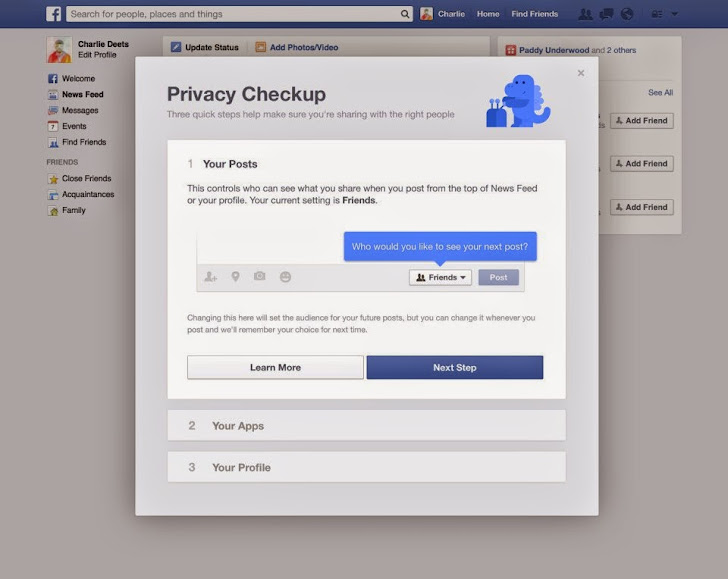 Facebook users would see a privacy checkup pop-up on their computers to go through the process in the next few days. The checkup tool guides users through their security settings and privacy controls with step-by-step instructions. The checkup is not available on mobile devices yet. checking who can see your privacy status of your profile information such as current city, employer, and so on. I'll be discussing all of the above points one-by-one later in my article. But, first ensure whether you have the checkup tool yet or not. Go through the walkthrough at any point by clicking on “Privacy Checkup” in the privacy menu at the top right corner of Facebook. Privacy Checkup will be available as a blue dinosaur next to the top option under the padlock icon > Privacy Checkup. Proceed, and Privacy Checkup tool will first ask you about who would you like to share your posts with by default. If that setting is Public, for example, then anyone can see what you're posting via the top of your News Feed or profile. You can change this setting to Private. Next, Privacy Checkup tool will give you an option to review the permissions you've granted to Facebook-connected apps. If your friends are fed-up with your favorite Facebook game posts crap all over your News Feed, you can set it to make those posts only visible to you. You can also delete those apps forever which you no longer use. Finally, the Privacy Checkup tool gives you an option to review the information you have filled into your Facebook profile such as relationships, phone numbers, work information, current city, employer, etc, and asks who you want to see that information. Click the "Finish Up!" button, when you're done, though you can always run a new privacy checkup whenever you want. None of the controls are new — they're simply being showcased, but still a clear and easy control provided in the users’ hand will go right.